Draft: 1999, Toronto Blue Jays, 17th rd. Reed Cameron Johnson...married to Taryn...has a son, Tyce, and daughter, Jordyn Elizabeth...graduated from Temecula Valley High School (CA)...was an All-League and All-County selection in baseball and soccer...attended Cal State-Fullerton and was an Academic All-American...was an All-Big West selection and first player in Big West to collect 100 runs and 100 hits. Was second in National League in batting average and on-base percentage as a pinch-hitter, with marks of .297 (11x37) and .395, respectively...Only pinch-hit homer of season came on May 30 vs. Toronto (two-run shot), off Todd Redmond in eighth inning of 11-3 win for Braves...Tied career high for ninth time with four hits on April 23 at Colorado. Also in that game, set career high with three doubles...Was on 15-day disabled list from July 29 until September 10 due to left knee tendinitis...Had a three-game hitting streak when placed on DL. Made return on Sept. 17 and was 0x9 in final eight games of season. Split the season between Chicago (NL) and Atlanta, playing in a combined 119 games, hitting .290 (78-for-269) with 14 doubles, three home runs, 20 RBI and 30 runs on the season...Traded to the Braves from the Cubs, along with LHP Paul Maholm, on July 31 in exchange for RHP Jaye Chapman and RHP Arodys Vizcaino...Led the Majors in pinch hits (18) and ranked second in pinch-hit average at .419 (18-for-43) (min. 20 AB)...Batted .308 (16-for-52) with RISP for the season. With Atlanta, hit .313 (5-for-16) with RISP...Played every outfield position throughout the season, making the most appearances in LF (37). Made 30 appearances in CF and 29 in RF...In 43 games with the Braves, batted .270 (27-for-100) with five doubles and four RBI. Reed batted .309 (76-for-246) with 22 doubles, a triple, five homers and 28 RBI in 111 contests for the Cubs...the 22 twobaggerswere his most since hitting a career-high 34 for Toronto in 2006...His 28 RBI surpassed the 15 he had in 102 games for the Dodgers in2010...he had 22 RBI in 65 games for Chicago in 2009...Appeared in 44 games in right field (28 starts), 27 games in left field(five starts) and 24 games in center field (16 starts)...Batted .332 (62-for-187) with 22 RBI in his 49 starts...Hit .306 or better in four months: .375 in April, .361 in May, .306 in Julyand .367 in August...Batted .324 (34-for-105) in the seventh inning or later...Posted a .375 batting average (33-for-88) with no outs in an inning...Was 44-for-141 (.312) against right-handed pitchers...batted .305(32-for-105) against southpaws...Batted .410 (25-for-61) with a .471 on-base percentage and .738slugging mark, April 12-June 15. That stretch included a stint on the 15-day D.L., May 26-June14, due to lower back spasms...Belted his third-career walk-off homer in the first game of the April 20doubleheader vs. the Padres...the long ball against Luke Gregerson ledoff the 11th inning and gave Chicago a 2-1 victory...Hit by a pitch four times in seven games with a plate appearance, April25-May 8...Belted his third-career pinch-homer, May 18 in Florida...the sixth-inning,two-run blast off Ricky Nolasco tied the game at 5-5...While on the D.L., rehabbed with Triple-A Iowa...was hit in the helmetby a pitch, June 11...returned to Chicago to be examined, June 13, andwas activated from the D.L. the next day...Tied his career high with four hits, August 10 vs. Washington, includinghis fifth homer of the season...previously had four hits in a game,August 17, 2008 vs. Florida. Reed signed as a free agent with the Los Angeles Dodgers and went on to hit .262 (53-for-202) with 11 doubles, two homeruns and 15 RBI in 102 games for the club ... missed nearly a month of the season with lower back spasms...Appeared mostly in left field, making 62 appearances including 24 starts... played 22 games in right field and six games in center field...Batted .301 (31-for-103) with nine doubles and two homers againstsouthpaws ... hit .222 (22-for-99) with two doubles off righthanders...Landed on the disabled list, July 9, with lower back spasms ... made abrief rehab appearance with Single-A Inland Empire and was reinstated,August 4...Hit .333 (15-for-44) when coming to the plate with none on and noneout...Began the year with a .314 batting average (27-for-86) and a .341on-base percentage in his first 45 games through June 7...Hit .224 (26-for-116) with a .254 on-base percentage in hisfinal 57 contests...Had a season-high three hits three times, most recently June 27 vs. theYankees...Hit safely in a season-best eight-straight games, May 17-30 ... batted.480 (12-for-25) during the run. A late pickup in Spring Training after he was released by Toronto, Reed proved valuable roaming the outfield while batting .303(101-for-333) in 109 games.© Batted .333 against left-handed pitchers (49-for-147) and .280 againstrighthanders (52-for-186) ... hit .318 on the road (55-for-173) and .313(51-for-163) in day games.© Posted a .357 batting average with runners on base (56-for-157) and a.358 mark with runners in scoring position (34-for-95).© Batted .310 or better in three straight months: .310 (9-for-29) in June,.340 (17-for-50) in July and .397 (23-for-58) with a .410 on-base percentagein August.© Hit .359 (46-for-128) after the All-Star break after hitting just .268 (55-for-205) in the first half.© Had a .465 batting average (40-for-86) when putting the first orsecond pitch of an at-bat in play.© Played 78 games in center field (64 starts), 26 games in left field (12starts) and six games (one start) in right field.© The club was 53-24 (.688) in his 77 starts.© Tied his career high with four hits April 17 vs. Cincinnati and August 17at Florida ... has accomplished the feat six times.© Collected his 600th career hit, April 18 vs. Pittsburgh.© Made a highlight-reel catch of Felipe Lopez' fly ball to left-center field,diving and landing against the outfield fence April 25 at Washington.© Belted his first homer as a Cub May 11 vs. Arizona off Juan Cruz ... thetwo-run shot tied the game at 4-4 in the seventh - the Cubs would go onto win, 6-4.© Landed on the disabled list with lower back spasms, June 18-July 3 ...batted .342 after his return.© Had two homers in a three-game span, July 23-25. Belted his second career grand slam July 23 in Arizona, finishingthe night 3-for-4 with two runs, a double, the homer andfour RBI - was his first slam since hitting a pinch-grand slamJuly 1, 2005 at Boston off Mike Myers ... added a solo shot July25 vs. Florida.© Belted his second career pinch-homer August 3 vs. Pittsburgh - theeighth inning, two-out blast was the game-winner and marked his firstpinch-homer since his pinch-slam July 1, 2005 at Boston. In a injury-plagued season, appeared injust 79 games while batting .236 with two home runs and 14RBI...Hit a game winning home run on Apr. 8 at TB, in the5th inning off LHP Scott Kazmir...ON THE SHELF: Appearedin eight games before going on the 15-day DL with aherniated disk in his lower back (retro to Apr. 12)...Had surgeryon Apr. 17 in Tampa, FL...Was batting .265 (9-34) withone home run & seven RBI in seven games prior to beingplaced on the DL...Was transferred to the 60-day DL onApr. 14...Made a rehabilitation assignment with bothDunedin (A) & Syracuse (AAA)...Was activated off the60-day DL on June 28... LEADING OFF: On July 23 vs.MIN, led off the game with a home run vs. Johan Santana...Itmarked Johnson's 1st leadoff home run of the season & the7th of his career (last on July 30, 2006 at OAK)...Batted .245(52-212) with 2-HR, 11-2B & a .316 OBP in 55 games as theleadoff hitter this season...On July 27, collected his 3rd careerfour-hit game (previous on Sept. 21, 2003 atBAL)...Batted .232 (55-237) after returning from theDL...OUCH: Since the start of 2003, ranks 2nd in the MLwith 80 HBP (J. Kendall leads with 85)...Led the Club &ranked T-10th in the AL with 11 HBP this season...Ranks2nd in Blue Jays history with 80 hit by pitches (CarlosDelgado holds the record with 122). CAREER NOTES: Currently ranks 2nd on the all-time Clublist with 80 hit by pitches...Holds the Blue Jays rookie recordwith 20 HBP (2003)...Has ranked in the top 10 in theAL in HBP in each of the last four seasons, finishing 2nd in2003 (20), tying for 10th in 2004 (12) and 2007 (11)...Hit hisfirst career grand slam (pinch-hit) on July 1, 2005 at BOS(3rd PH-GS in Club history)...On June 15, 2003 vs. CHC hita leadoff home run and ended the game in the 10th inningwith a walkoff home run... Became just the 4th player in MLhistory to accomplish such a feat... The last player to do sowas Anaheim's Darin Erstad on June 25, 2000 vs. MIN...The other two were players to hit a leadoff and walkoffhomer in the same game were Vic Power of the KC A's onMay 7, 1957 and Billy Hamilton of the Philadelphia Phillieson May 17, 1893. Was his 4th full season with the Blue Jays...Set careerhigh figures in batting avg. (.319), runs (86), hits (147), doubles(34), home runs (12), walks (33), and HBP (21)...The21 HBP led the Major Leagues, and broke his own Blue Jayrecord of 20 in 2003... Finished the season 10th in the ALwith a .319 average... Was 11th in OBP (.390), and T-5th inhome batting avg. (.342)...Led the Blue Jays with a .365 averageprior to the All-Star break, also had an OBP of.451...Recorded his 500th career hit on Sept. 3 at BOS...Hit home runs on consecutive days for the 1st time in his careeron Aug. 11 & 12 at MIN... Led the AL in doubles for Julywith 12...Tied a Major League record for the 2nd & 3rd timeon Apr. 7 vs. TB & Apr. 29 at NYY by being struck three timesin the samegame...It represented the 5th time he was hit onmultiple occasions in the same game... Recorded hits in sixconsecutive at-bats May 9 & 10, falling two short of the clubrecord. Appeared in a career high 142 games...Batted .269with eight home runs and 58 RBI...Enjoyed his greatestsuccess against the Boston Red Sox, batting .333 (13-39)with three home runs and 15 RBI... May 24 vs. BOS, enjoyedhis second career multi-homer game (and first since2003)... Finished the game with a three-run walkoff homerun in the bottom of the 9th inning off Allan Embree, givingthe Blue Jays a 9-6 win...Marked his second career walk-offhome run...July 1 at BOS, collected a career high six RBI,the most in a single game by a Blue Jay in 2005... Hit apinch hit grand slam off Mike Myers in the 6th inning... Washis first career grand slam and the third pinch hit grand slamin Jays history... Held a 1.113 OPS against the Red Sox in2005...Made 47 starts as the leadoff hitter, batting .298 inthat capacity with a .366 on-base percentage...Had ateam-leading 19 pinch hit at bats, collecting four hits andfive RBI in those instances... Was hit by pitch 16 times, rankingsecond on the team and tying for fifth in the AmericanLeague. Played all three outfield positions, making 125starts...Was second among Blue Jay outfielders with nineoutfield assists... Saw most of his action in the leadoff spotand batted .274 (.317 OBP) with seven home runs and38 RBI...Recorded two walk off hits, May 7 vs. CWS (RBIsingle) and June 23 vs. TB (RBI, 10th inn. single)... Hit twoleadoff home runs, Aug. 23 vs. BOS and again on Aug. 29vs. NYY. Was among AL rookie leaders in most offensive categories...2nd in batting (.294), 4th in runs (79), 7th in hits(121), 8th in total bases (176) and 9th in RBI (52)... Led theBlue Jays and was 5th among rookie outfielders with six assists...Led all AL rookies with a .353 OBP... Was 2nd in theAL with 20 HBP... Was named as the AL rookie of the monthfor September after batting .363 in 25 games... Started theseason with Syracuse before having contract purchased onApril 12... Played in three games and made ML debut as apinch-runner on April 17 at NYY... Recorded first ML hit andRBI (RBI single) in first AB (2nd plate appearance) on April20 at BOS in first ML start... Was optioned back to Syracuseon April 21... Was recalled to the Blue Jays on May 16 forthe rest of the season... In thirdMLstart hit firstMLhome runon May 17 at KC, solo off Affeldt...The Blue Jays were 42-15when he scored at least one run and were 15-1 when hescored two or more runs in a game... Hit two lead off homeruns, June 15 vs. CHC and Sept. 12 vs. BAL...In the 1st slotin the order batted .291 with a .353 OBP to rank 4th amonglead off hitters in the AL... On June 15 vs. CHC hit a leadoffhome run and ended the game in the 10th inning with awalkoff home run... Became just the 4th player in ML historyto accomplish such a feat... The last player to do so was Anaheim'sDarin Erstad on June 25, 2000 vs. MIN... The othertwo were players to hit a leadoff and walkoff homer in thesame game were Vic Power of the KC A's on May 7, 1957and Billy Hamilton of the Philadelphia Phillies on May 17,1893... Was first career multi home run game... Posted thelongest hit streak among ML rookies, collecting a hit in 20straight games from Aug. 29-Sept. 23... During the streakbatted .391 (34-87) with 17 RBI... Was the longest ever hitstreak by a Blue Jays rookie, surpassing Alfredo Griffin's 14game hit streak in 1979 and Shawn Green's 14 gamer in1995. Missed the first two months of the season with a wristinjury (right wrist)... Was activated off the DL on June 9 withDunedin of the FSL (A)...Was promoted to Syracuse of theInternational League (AAA) on June 16...Aug. 4 at Buffalobroke a finger sliding into second base and missed the remainderof the season... Played in the Dominican WinterLeague and appeared in just seven games before injuringhis hand... Batted .368 for Escogido. Was a Southern League (AA) All-Star after hitting.314 with 29 doubles, four triples, 13 home runs and 74 RBIfor the Tennessee Smokies... Led the league with 174 hitsand 104 runs scored, was second in average and second instolen bases with 42... Was second in the organization inbatting and stolen bases and ranked fourth in RBI... On August 28 hit a game winning grand slam in the bottom of theninth to defeat West Tennessee... On August 31 was 4-6with two doubles, a triple and a career high seven RBI...Was recognized by the Southern League as showing theBest Hustle. Combined to hit .298 with 33 doubles, seven triples,12 home runs with 98 RBI and a .420 on-base percentage...Was sixth in the organization in batting and second inRBI... Led all Class A batters with 25 hit by pitch... Was secondin the league with a .422 on-base percentage... Movedto Dunedin on July 26 where he played in 36 games and hit.316 with nine doubles, four home runs and 28 RBI... OnAugust 8 vs. Lakeland reached base safely seven times,had three hits and four walks. Made his pro debut with St. Catharines of the NewYork Penn League (A)... Played 33 straight games withoutan error from June 24 to August 6. 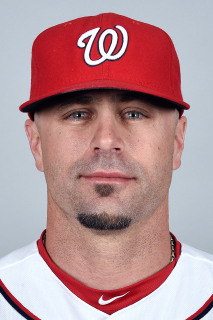 April 1, 2016 Washington Nationals released LF Reed Johnson. December 19, 2015 LF Reed Johnson assigned to Syracuse Chiefs. October 6, 2015 Washington Nationals signed free agent LF Reed Johnson to a minor league contract and invited him to spring training. October 5, 2015 LF Reed Johnson elected free agency. September 26, 2015 Washington Nationals activated LF Reed Johnson from the 60-day disabled list. August 13, 2015 Washington Nationals sent LF Reed Johnson on a rehab assignment to Potomac Nationals. April 5, 2015 Washington Nationals selected the contract of LF Reed Johnson from Syracuse Chiefs. April 4, 2015 LF Reed Johnson assigned to Syracuse Chiefs. March 31, 2015 LF Reed Johnson assigned to Washington Nationals. March 29, 2015 Miami Marlins released LF Reed Johnson. February 17, 2015 Miami Marlins signed free agent LF Reed Johnson to a minor league contract and invited him to spring training. February 17, 2015 LF Reed Johnson assigned to New Orleans Zephyrs. October 30, 2014 LF Reed Johnson elected free agency. March 30, 2014 Miami Marlins selected the contract of LF Reed Johnson from New Orleans Zephyrs. January 31, 2014 Miami Marlins signed free agent RF Reed Johnson to a minor league contract and invited him to spring training. January 31, 2014 RF Reed Johnson assigned to New Orleans Zephyrs. November 4, 2013 RF Reed Johnson elected free agency. September 10, 2013 Atlanta Braves activated RF Reed Johnson from the 15-day disabled list. July 30, 2013 Atlanta Braves placed RF Reed Johnson on the 15-day disabled list retroactive to July 29, 2013. Left Achilles tendinitis. December 6, 2012 Atlanta Braves signed free agent RF Reed Johnson. November 3, 2012 LF Reed Johnson elected free agency. January 3, 2012 Chicago Cubs signed free agent Reed Johnson. October 30, 2011 LF Reed Johnson elected free agency. June 14, 2011 Chicago Cubs activated LF Reed Johnson from the 15-day disabled list. June 9, 2011 sent LF Reed Johnson on a rehab assignment to Iowa Cubs. April 1, 2011 Chicago Cubs selected the contract of LF Reed Johnson from Iowa Cubs. January 17, 2011 Reed Johnson assigned to Iowa Cubs. January 12, 2011 Chicago Cubs signed free agent LF Reed Johnson to a minor league contract and invited him to spring training. November 7, 2010 LF Reed Johnson elected free agency. August 4, 2010 Los Angeles Dodgers activated LF Reed Johnson from the 15-day disabled list. August 1, 2010 sent LF Reed Johnson on a rehab assignment to Inland Empire 66ers. February 1, 2010 Los Angeles Dodgers signed free agent LF Reed Johnson. November 5, 2009 CF Reed Johnson elected free agency. September 21, 2009 Chicago Cubs activated CF Reed Johnson from the 15-day disabled list. July 6, 2009 Chicago Cubs activated CF Reed Johnson from the 15-day disabled list. July 3, 2009 Chicago Cubs sent CF Reed Johnson on a rehab assignment to Peoria Chiefs.